What is 30 Year Report? If a person is looking for a comprehensive analysis having in-depth astrological calculations and predictions, then the 30 Years Horoscope online Report offered by Future Point is the answer. It not only contains all astrological calculations but also Lal Kitab, Numerology and other various types of calculations including various types of Dasha system with comprehensive predictions with annual report with twelve months detailed prediction for each year and thirty year life predictions with antardasas report for getting a greater idea about the natives future. It nutshell we can say that 30 year report is like an ocean of astrological calculations and predictions which helps the astrologer and native to get an idea about natives past and make predictions about future. Since it involves the analysis of a plethora of astrological charts, it makes the astrologer to come up with accurate predictions about the natives future. Use of Numerology does not leave room for missing on any aspect while predicting the future of the native, as it takes into account the highly powerful effect of numbers on the native. The native can identify his/her true potential and know which fields in terms of career or education are suitable as far as getting lucrative opportunities of growth is concerned. It paints a vivid picture of the health situations of the native that the planetary positions signify therefore, one can take timely precautions to avoid any health hazards. It lets one know about the ups & downs signified in terms of finances and provides the opportunity to perform special remedies to pacify/nullify the negative periods to come and enhance the benefits that the positive periods hold. 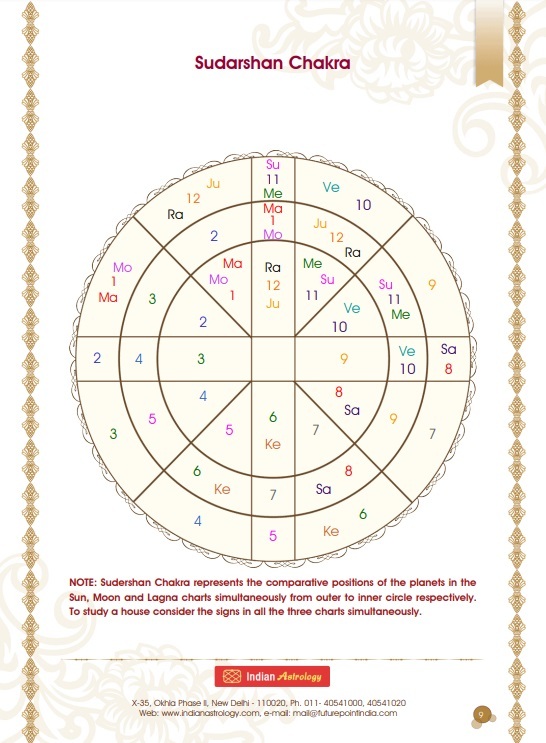 This incredible 30 year report, not only incorporates multiple charts as per the principles of Vedic astrology, but also takes into consideration, the effects of Lal Kitab, KP System and Numerology as well. This report can be very well called a "life book" that has extensive analysis containing Dashaphal and Transit predictions. It also contains an annual report with twelve months detailed prediction for each year and thirty year life predictions with the Antardasas report for getting a greater idea about what the natives future holds for him/her. Tables of Significator & Ruling Planets in KP. Furthermore, it guides about the adjustment of the "Name Number" and calculation of all lucky objects like Day/Date, Lucky vehicle number etc as per Numerology. It provides time tested remedies of Sadesati, Manglik Dosh and Kalsarp Dosh as well, if they are signified in the natives horoscope. It analyzes Lal Kitab Debts that the native carries and provides remedies for them and certain remedies for Lal Kitab Varsha Chart as well that are to be used in the beginning of the year to make the year more auspicious. It not only identifies and recommends the favourable Gemstones to be worn but tells the method of wearing that Gem along with the auspicious Muhurat, Mantra & Donate Items associated with the process.